A 13-meter high giant pike singing with its mouth wide open now occupies a prime location at the square in front of the Helsinki Music Centre in Helsinki, Finland. The Laulupuut (‘Song Trees’) artwork, designed by sculptor Reijo Hukkanen, also extends around the pike. The sculpture made of aluminum and steel has proven exceptionally popular. However, both its makers and Hukkanen himself let out a sigh of relief when it was erected in August 2012. The totem-like sculpture consists of three parts. The pike at the center has alder branches entwined around it. Next to the pike are two towers made of the lids of concert grand pianos and piles of firewood. The artwork measures six meters in width and nine in length. The making of the 50,000-tonne sculpture required more skill and time than anyone would have thought. The head of the pike and the five firewood piles were cast at the Lapinlahden Taidevalu Oy’s foundry. This stage of the project alone took two years. 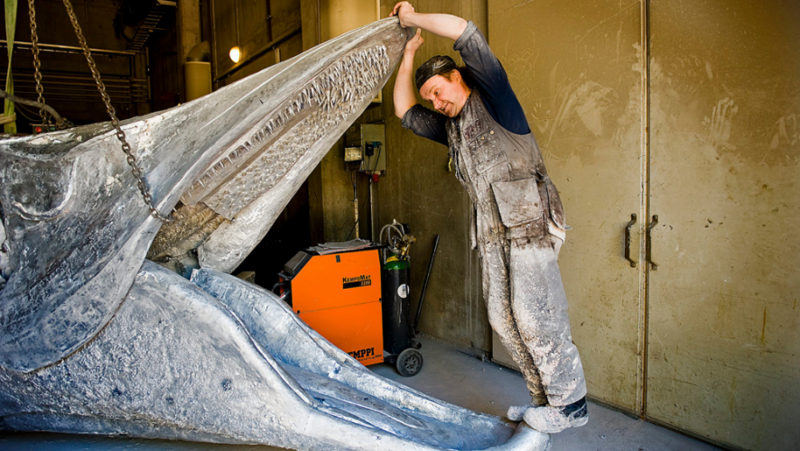 “Welding and finishing the teeth in the upper jaw of the pike took several days,” Tomi Sinisalo of Lapinlahden Taidevalu Oy says, shedding light on the scale of the project. The head of the pike is made of 70 separate cast pieces. Sinisalo recalls that 1,600 kg of plaster was used to make the molds. The head, weighing 700 kg, and the firewood piles were welded together using aluminum. All welding was done with Kemppi’s Kempomat 3200 machine equipped with a push-pull gun which made wire feeding more efficient. Ever since their introduction to the market, the world-famous Kempomat machines have been popular MIG/MAG welding devices among professional welders. In 2012, Kemppi replaced the Kempomat range with the new Kempact RA range, which was recognized with the prestigious iF product design award soon after it was introduced. The other parts of the sculpture were made at Halikko IKP Works Oy. Plater-welder Marko Yli-Tokola, who was in charge of the production process, estimates that he spent around two thousand hours on the project. The sides of the pike were made of a 40 mm thick sheet while the tail was made of a 20 mm thick sheet. “Most of the work had to be done by hand. For instance, I bent the tail of the pike to shape by heating the sheet metal to a red glow and shaping it with a sledge hammer and hammer,” he explains. Yli-Tokola also finished the sides of the fish by hand. That involved making thousands of holes with a router. “The edge of each hole had to be ground round to a certain measure to prevent the painted surface from cracking and causing rusting. The aim was to produce high-quality work which would be as durable as possible,” he sums up. 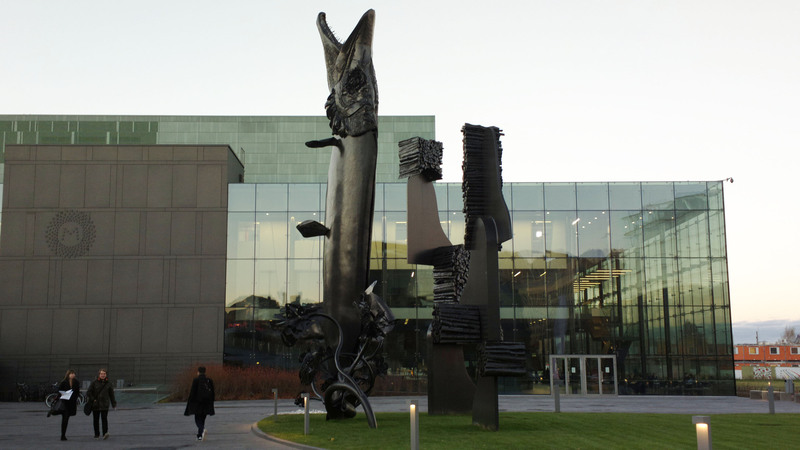 Sculptor Reijo Hukkanen’s Laulupuut sculpture won the 2010 Helsinki Music Centre Art Competition, which received nearly 800 entries in total. Hukkanen got the idea for his sculpture from ‘The Pike’s Song,’ a poem by Aaro Hellaakoski. It was first published in the anthology Ice Mirror in 1928 and is one of the most discussed poems in 20th-century Finnish literature. In the enigmatic stanzas, a fish is singing a hymn and biting on a red cone at the top of a fir tree. The poem, which Hukkanen had heard on the radio as a schoolboy, came back to his mind when he was sketching entries for the competition. “I had a lot of ideas and even made some scale models, but nothing really worked. Then my eyes fell on a plastic whale I had bought as a souvenir at the American Museum of Natural History in New York, which was leaning against the wall. I said to my wife that even fish can sing here, but I cannot do anything.” At the same moment the poem about the pike came back to Hukkanen and gave him the idea for the sculpture. “Still, my idea was not to illustrate the poem. The sculpture is like a piece of knitting that turned out as a mitten thanks to good luck,” he describes. Hukkanen was closely involved in the production of the artwork. He is very impressed by the workmanship he witnessed. 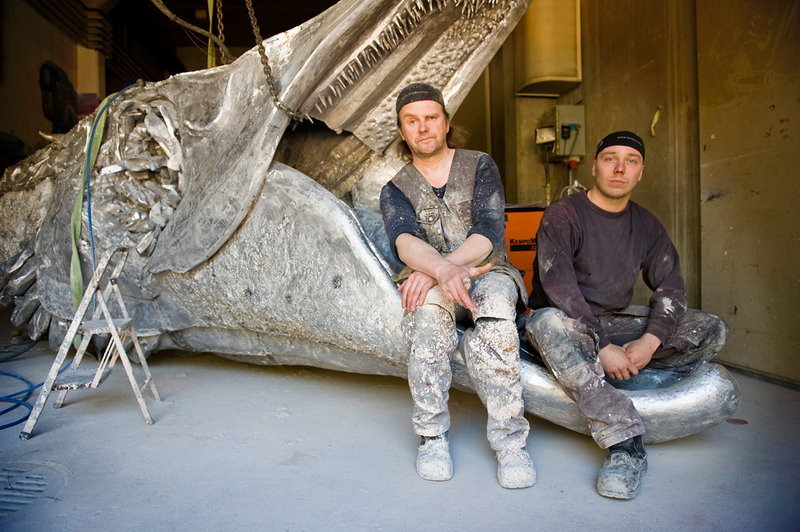 “Assembly and weld seams are an important aspect of the sculpture. 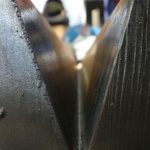 The weld seams have their own visual characteristics. That is why each joint had to be considered carefully.” He was surprised at how complex and demanding welding work is. 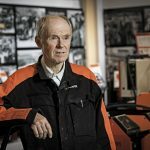 ‘It still looks like a miracle when two pieces of metal are joined together.’ Hukkanen has been touched by the number of people who have told him about their affection for Laulupuut.